Driving our border collies back from the vet’s office, we noticed a grandmother playing in her flower garden. On her hands and knees, she planted annuals while her grandson hopped along the driveway. Then came that flashback moment of being a kid again, watching my grandmother on her hands and knees tending to her garden. A love for the outdoors is like any of the wonderful things in life: music, art, literature or food. If you are not exposed to them, one never understands or appreciates its complexity or beauty. As Richard Louv's book, Last Child in the Woods: Saving Our Children from Nature-Deficit Disorder, points out the value of spontaneous outdoor play and the connection with nature during childhood. Rachel Carson states, "If a child is to keep his inborn sense of wonder, he needs the companionship of at least one adult who can share it, rediscovering with him the joy, excitement, and mystery of the world we live in." Take it upon yourself to be that one adult to a child. If you love nature, share it. Don’t keep it a secret. Spread your enthusiasm. Take them to a farmer’s market if they live in an urban environment. Expose them to the locally grown produce and to the people that grow what they eat. Bring them to a park or a children’s program at a local botanical garden. Go to the U-Pick farms and allow them to experience nature while enjoying fresh fruit they can touch and taste. 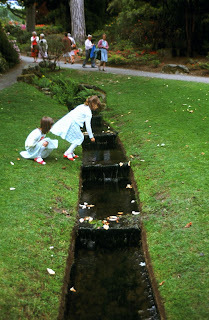 As Zenobia Barlow, “Confluence of Streams” writes, "Children are born with a sense of wonder and an affinity for nature. Properly cultivated, these values can mature into ecological literacy, and eventually into sustainable patterns of living." While Facebook may be their social network, expose them to the network of nature. Children are the future stewards of the land. Here is a favorite photo taken at Bodnant Garden in Northern Wales, UK.